The equliateral triangle tetraflexagon is sometimes called a flexacup or pyramid flexagon. The following video shows an interesting illusion on a silver tetraflexagon. You can find a template for making it at Silver Tetraflexagon Illusion page. Four triangles meet in the center of a triangle tetraflexagon, so if you want it to lie flat, you should use right triangles. An obvious selection is a 45-45-90 (silver) triangle. This will give you a square when the 90 degree angles are in the middle. To flex, fold it in half diagonally then open it along the bottom of the longest edge of the triangle giving you a small square. Open this at the vertex opposite the one you closed and it’ll open up to a triangle. Open this up at the tip and you’ll arrive at another full square with four triangles meeting in the center. Note that you won’t always be able to travel through this entire sequence. A single copy of this first net gives you a silver tetraflexagon while two copies gives you an octaflexagon. Cut out the net and pre-crease all the edges. Copy the small numbers on to the back. To fold the 3 sided silver tetraflexagon, fold the adjacent 2’s together then slip one end under the other so the other pair of 2’s face each other. Tape the tabs onto the appropriate faces. This should give you a square with four 1’s on one side and 4 3’s on the other. There are a couple flexings that will reveal the 2 face but you can’t open it up. 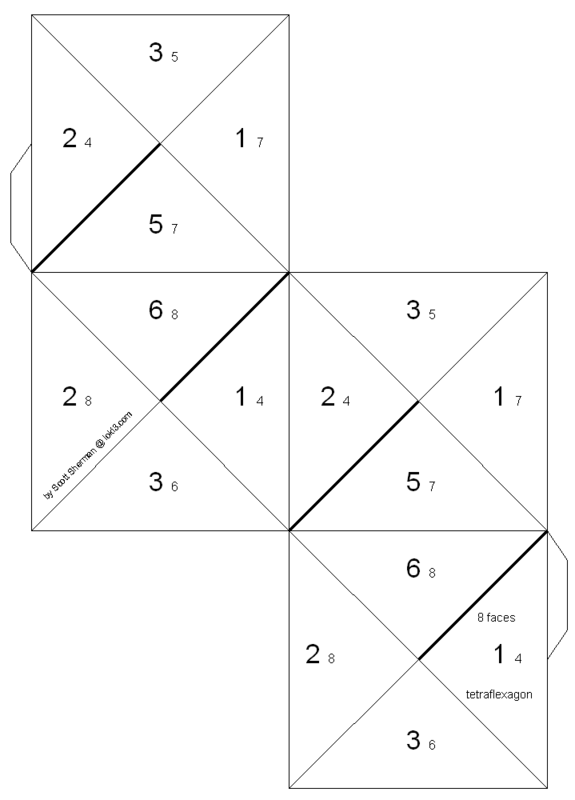 To fold the 8 sided version, fold 8 on 8, 7 on 7, 6 on 6, 5 on 5 and 3 on 3. Now fold the adjacent 4’s together and tuck one end under the other so the other pair of 4’s face each other. You should be able to get faces 1, 2, 7 and 8 to lie flat. The other faces can be seen on the inside as you flex between states. Another possible triangle tetraflexagon uses equilateral triangles. Since 4x60 < 360, this one never opens flat. In fact, as you flex it the same side will always be on the outside. But you’ll see the inside number change as you flex. Start by folding the 1’s onto the adjacent 1’s. Fold the adjacent 2’s together then the adjacent 3’s. This will leave you with 0’s on one side and 4’s on the other. Fold it in half and tape the tabs onto the appropriate faces. This should leave you with 0’s on the outside. You should be able to open up one corner and see 4’s or the other corner to see 3’s. If you open up the 3’s, keep flexing until you fold it in half the other way. You can then open up the opposite corner to see the 2’s. 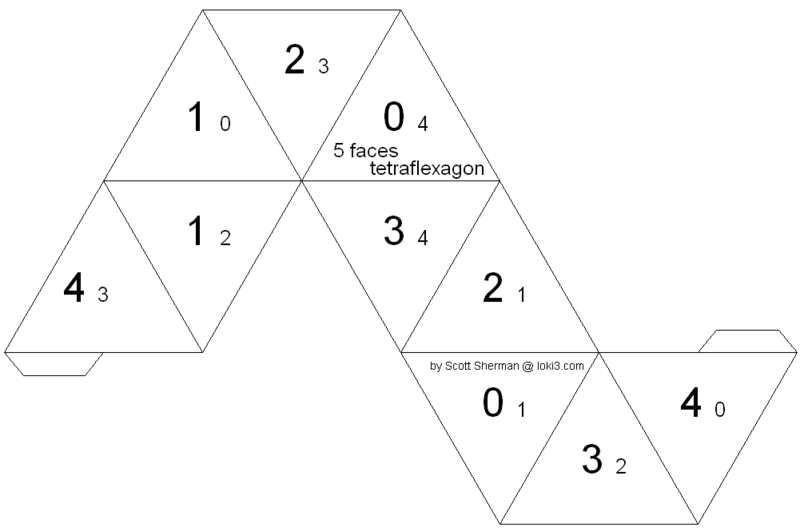 One way to create others of this variety is to start from any hexaflexagon strip and use two copies of the pattern instead of three. Due to the nature of this flexagon, however, you probably won’t be able to reach all the sides. To derive a more optimal strip, simply paste together the sides you can’t get to. Cut along the solid lines and pre-fold along the dashed lines. The dashed lines along the outside edge of triangles 1/5 indicate that this edge will be connected to another edge. Copy the small numbers onto the backs of the triangles. Tape together the dashed edge of 1/5 to the short edge of 3/2 such that 1 and 2 are on the same side and 3 and 5 are on the same side. Fold adjacent 5's on top of each other and adjacent 4's on top of each other. This may require a bit of twisting. Fold together the single pair of adjacent 3's. One side should now have four 1's and a 3 while the other side has four 2's and a 3. Fold the middle pair of 2's together and finish by folding the adjacent 3's together. Tape the dashed edge of 1/5 to the short edge of the 3/2 below it. You can now use the pivot flex to reveal side 4. If you pivot back to side 1, you can open up the inside (with 2's) to make a diamond. Open up the other side (with 3's on the inside) then do another pivot to get to side 5.